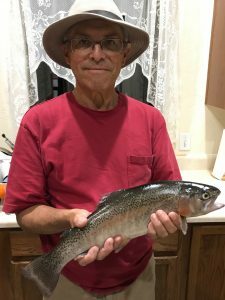 Rich G. of Flagstaff: On, Friday, got skunked at Ashurst after four hours of fishing. Stopped at Lower Lake Mary on the way home. Caught this nice rainbow fly fishing with a Beaded Prince Nymph right about dusk at Lower Lake Mary. Fished a couple hours just before sunset and caught some small rainbows. Just enough light left and decided to make one last cast and bang! Just shy of 18 inches.